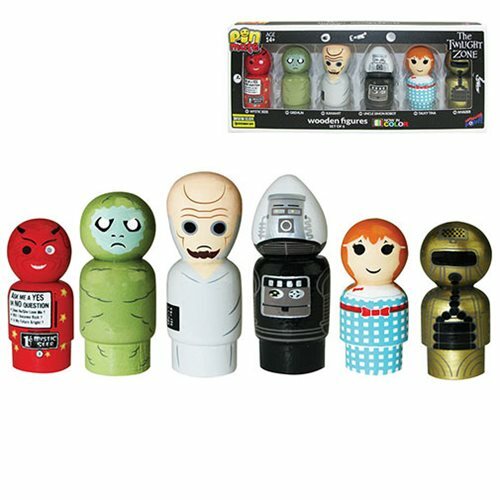 First-ever Pin Mate™ set celebrating iconic characters from The Twilight Zone. One-of-a-kind, retro-styled, miniature wooden figures. Numbers 1 – 6 in the series for true collectibility. In addition, each complete boxed set in this limited edition run is individually numbered with a holographic sticker. You are about to enter another dimension, a dimension not only of sight and sound but of miniature wooden figures from some of the most classic scenes of The Twilight Zone in a new Pin Mate form from Bif Bang Pow!. Designed in a retro-style, these 6 miniature wooden figures are designed with intricate 360-degree artwork that includes hand-painted details alongside limited decals, which showcase Mystic Seer, Gremlin, Kanamit, Uncle Simon Robot, Talky Tina, and Invader. Proving some of the best things do come in small packages, each character is creates in a 2-inches scale and is uniquely numbered on the bottom of the figure: Mystic Seer is number 1; Gremlin is number 2; Kanamit is number 3; Uncle Simon Robot is number 4; Talky Tina is number 5; Invader is number 6. Plus as an Entertainment Earth Convention Exclusive, each limited edition set is individually numbered with a holographic sticker. Ages 14 and up. NOTE: This item will first be sold at San Diego Comic-Con 2016 at the Entertainment Earth Booth #2343. If supplies remain after the show, your order will be filled and shipped to you then, in August 2016.